I genuinely can’t imagine many things better, 3 inches above the tarmac, the wind in my hair and beautiful scenery whizzing past. No windows, no doors. Just the road and the view. Add the feeling of adrenaline and the addictive skill set required to skate an electric board with ease compounded by the above, it pretty much guarantees that you have all the ingredients for an experience that will in-grain itself into your memory for a very longtime. Heres a list of cool locations to head out for a skate on your electric longboard. 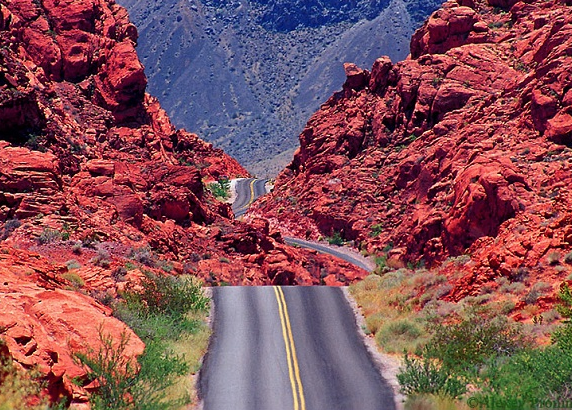 Valley of Fire road, Nevada. NY will always be a sick place to ride and this section offers space. The views range from classic farm houses, local wineries, small towns….. and of course finger lakes! Take a look if you’ve got your Magneto in the NY area. We’re looking at extending this post. Live near or know of some roads you think we should would be sick to skate on? Take some pictures and email them over lee@magnetoelectricskateboard.com and we’ll feature them. Ride safe guys and don’t do anything I wouldn’t. Peace out. Magneto.